Drew University provides a range of accommodations for guests with disabilities to ensure their safety, comfort and enjoyment of our events. To request appropriate arrangements, please call the events accessibility line at 973-408-3103. Social media sites like Facebook, Twitter, Instagram, Snapchat and YouTube and other networking and blogging platforms have become valuable tools for communicating with the university’s many constituencies. For some audiences they are actually the preferred way to stay in touch with Drew, its schools, departments and programs. While the university supports this decentralized, informal approach to communications, it also recognizes the impact these sites can have, both positively and negatively, on the overall perception of the university. This policy sets forth the expectations of those who create social media accounts that represent the university. Social media users acting on behalf of the university must adhere to applicable Drew policies and procedures. Official Drew social media accounts are to be administered by internal members of the Drew community. At least two employees should be listed as administrators at all times to ensure the protection of this policy. Should a Drew employee administrator of an account leave the university for any reason, or no longer wishes to be an account administrator, it is that individual’s responsibility to designate another Drew employee to be an account administrator prior to removing himself or herself from that role. If there are not two employees available to serve as account administrators, a member of the Communications Department will serve in that capacity. If there are any problems identifying a new administrator, please contact the Communications Department. Drew employees identified as administrators of accounts are held responsible for managing and monitoring content of their officially recognized accounts. Administrators are responsible for removing content that may be in violation of university policies. The user name and password should be registered with the Communications Department to ensure the university retains the ability to access and edit the account in the event administrators leave Drew. Student and alumni organizations that wish to create social media accounts that will be officially recognized by the university must be registered through the Office of Student Activities or the Office of Alumni Relations. Unregistered student or alumni organizations are welcome to create social media accounts; however, they will not be officially recognized by Drew. Non-official users are not to use official Drew logos without consulting with the Communications department first. When using Drew logos, only the social media “D” or block DREW logo may be used in connection to your official Drew page. For the sake of consistency, please refer to the university as “Drew University,” “Drew” or “DrewU”, and refrain from other abbreviations. Use good judgment about content: respect privacy laws, FERPA and Drew’s Human Rights Policy. Do not to include confidential information about the university, its staff, or its students. You may not post any content that is threatening, obscene, a violation of intellectual property rights or privacy laws, or otherwise injurious or illegal. Representation of your personal opinions as being endorsed by the university or any of its organizations is strictly prohibited. You may not use the Drew name to promote any opinion, product, cause, or political candidate. Be sure to include the statement: “this is my personal opinion and not necessarily that of the university” when necessary. While Drew does not regularly review content posted to social media sites, it shall have the right to remove any content for any reason, including but not limited to: use of curse words, content that it deems threatening, obscene, a violation of intellectual property rights or privacy laws, or otherwise injurious or illegal. When using or posting online material that includes direct or paraphrased quotes, thoughts, ideas, photos, or videos, always include citations and/or provide a link to the original material, if applicable. Refrain from using information and conducting activities that may violate local, state, or federal laws, and regulations. Be authentic in your postings. Exercise common sense in any online activity realizing that anyone can access and view what you have posted. Evaluate the accuracy and truth of your posting before making it public. If you find out something you’ve posted is untrue after you post it, retract and correct it as quickly as possible. Avoid lengthy approval processes for comments. Respond to comments as quickly as possible. Respect the opinions and privacy of your students and colleagues. Avoid online confrontations and conflicts. Feel free to respectfully disagree with a position but please do not attack the person as it reflects poorly on both the individual and Drew. Encourage open conversation – listen to people and respond to as many comments as possible with constructive feedback. Allow negative comments (delete the spam) and respond if necessary rather than censor. Don’t start a social media effort unless you have the dedicated time and resources to maintain new content on a regular basis. New content on a weekly basis is suggested. Before starting a social media campaign, research other organizations on social media networks for ideas. You will probably be taking photographs of your trip as personal souvenirs, but Drew is also looking for images that illustrate the various learning experiences available at Drew. Since the university is not able to send photographers with most off-campus programs, we need your help in documenting your trip. Here are some pointers on how to get the best images for your own photo album, as well as Drew’s! Tell a Story – What is the experiential or service learning focus of this trip? Can you take a picture that illustrates that? Instead of large, posed groups, try to capture a small group engaged in activities that exemplify this off-campus program. Convey a Sense of Place – What elements of the setting would help identify the climate or culture where the picture was taken? Natural elements, signs, architecture, people, and clothing can all be clues for the viewer. Fill the frame – move in closer, or use zoom, in order to fill the picture frame with your subject; this makes your subject the focal point and eliminates extraneous information. Watch your back(ground) – buildings, landscape or interiors can help establish a sense of place so it’s good to include some elements in your picture; but try to frame your picture, or shoot from a different angle, to eliminate distracting background details. Avoid Amputations – When shooting people don’t center the picture frame on their heads because this cuts off their legs; better to adjust your lens downward so people’s heads are toward the top of the picture frame. Mad Dogs – You’ve heard that only mad dogs and Englishman go out in the noonday sun? It’s also best to avoid taking pictures when the sun is overhead; best times are early morning or late afternoon when the sun is at a low angle. If you are taking pictures mid-day, a cloudy day or open shade is more flattering for people shots. What’s the Point? – The most memorable pictures have a point of interest. Frame your shot to achieve this (and make sure the subject is in focus). If you are taking pictures of people, get faces rather than the back of heads. Bigger is Better – Shoot pictures at the highest resolution your camera will allow. Fashion Tips – We’d prefer not to have brand logos in the picture (however, we love it when some Drew swag is worn). Clothing should reflect local cultural practices – for instance, head scarves on women when visiting a Muslim country – and not be overly-revealing. Send your photos to Lynne deLade, Office of University Communications, at ldelade@drew.edu. The Drew University Office of Communications publicizes university news and developments, faculty and student achievements, matters involving the president and administration, special accomplishments, programs, events and activities and other news related to the activities of the campus community. All releases intended for external audiences must be routed through the Chief Communications Officer. The following is a general policy intended to facilitate positive interactions with external media while keeping the communications staff appraised of happenings and news on campus or involving Drew personnel or students. The Chief Communications Officer, at the appointment of the president, serves as the official university spokesperson and conveys the official university position on issues of general university-wide impact or significance or situations that are of a particularly controversial or sensitive nature. Inquiries from the media about such issues should be referred to the Chief Communications Officer. Members of the faculty and staff are free to respond to requests from the media regarding their research, scholarship, teaching or professional experience. In such cases, the Chief Communications Officer should be notified as soon as possible in case there is a request for follow up or additional requests involving Drew personnel, so there is a coordinated, consistent university response. Faculty, staff and students also have the right not to speak with the media. The Chief Communications Officer should be notified about noteworthy or negative occurrences involving the university, its employees, students, alumni, parents or donors that are likely to rise to the level of a news story. Any media inquiries that involve information about specific students should be directed to the Dean of Student Life at 973-408-3390. Such inquiries will be handled in strict compliance with the Family Educational Rights and Privacy Act, which protects the confidentiality of a student’s education record or disciplinary actions. Any media inquiries involving faculty or staff should be referred to the Director of Human Resources at 973-408-3223. In the event of a crisis or emergency situation, the Chief Communications Officer will handle all contacts with the media and will coordinate the information flow from Drew University to the public. In the event of a major crisis on campus or of an emergency situation, it is essential that that accurate information is given out and inquiries are routed to the appropriate sources. The Vice President of Communications is responsible for the dissemination of all university communications with the media in the event of an emergency and may be reached at 973-408-3706. If the Vice President is not available, calls should be routed to the Media Relations Specialist 973-408-3628, then the president’s office at 973-408-3100 and finally, the Department of Public Safety chief at 973-408-3379. Drew University is an open campus for visitors. However, access to campus facilities for media requires prior approval from the Drew Office of Communications or from the director of sports information for Athletics. That includes campus buildings, athletics facilities, the library, residence halls, Dorothy Young Center, Shakespeare Theater, Ehinger Center, the Dining Commons, and other buildings or properties on the Drew campus or owned by Drew University. Media representatives do not need permission to be on public streets adjacent to Drew. However, if they are on the Drew campus without prior approval, Public Safety may be contacted and the media representatives may be asked to leave. Still or video images of campus features may not be used for commercial or promotional purposes outside of scheduled news coverage without approval from the Department of Housing, Conferences and Hospitality at 973-408-3103. News or press conferences should be scheduled and announced only through the Department of Communications. View archive of Drew News. Share this template with your mail house vendor so they understand Drew’s expectations for formatting letters and envelopes. If you are working with a new vendor, you may need to make repeated corrections to achieve these standards. It is worth the effort since the look and feel of a direct mail piece affects the likelihood recipients will respond to your call to action and reflects on the university as a whole. Live not-for-profit stamp on envelopes or non-profit (mail house) indicia on brochures, post cards or other self-mailers, for all mailings of 250 or more pieces. Address block text printed in 12 point type in the formatted provided (i.e., initial caps not all caps) and in font that matches the letter. UPC bar code printed beneath address block. Left /right margins of letter no less than 1″ and 12 point font (if absolutely necessary, you may reduce to 11 point type however this negatively impacts readability). If letter is more than one page long, be mindful of where the break is made in the text and print double-sided rather than using two sheets. “Z” fold when possible with address block facing the envelope flap- side. If match numbers are needed, place in discrete locations and as small as possible. If you are using data provided by Advancement Services, acquire an NCOA Screening report and provide to the mail house each time you submit a data file (otherwise you incur an additional charge for screening). You may wish to “seed” yourself and/or others in the data file so that you receive the mailing. This allows you to see the finished product and be aware of when it is actually arriving. Ask for samples of the entire package (i.e., letter, gift form, carrier envelope, etc.) with actual merged data before the final printing to make sure all formatting is correct. Pay postage before mailing can drop. Follow up with mail house to verify drop date. You may also want to ask for final samples for your files and make notes about ways to improve the next mailing. The Office of Communications can help you build visibility for your events and connect with your audiences. Marketing support is available for events that are intended primarily for external audiences. Prior to contacting the Office of Communications for support promoting your event, take some time to gather answers to the following. How will this event advance the University? Who is the primary audience for this event? What is the appropriate tone for communications related to this event? What barriers might there be for your audience? What do you want your audience to remember from this event? What are resource-efficient, audience-centered methods for achieving this? What is the event title? When is the event taking place (date(s) and time(s))? Where is the event taking place (campus accessibility language must be included on invitations to all public events)? How would you briefly describe this event? Do you need people to register ahead of time? If so how (by calling, emailing, online form)? By when should people register? Is there a fee to register for this event? If using a registration form, what other information should be collected (e.g., guest name, affiliation with Drew, etc.)? If presenters and/or distinguished guests are involved, what are their names and, if applicable, is a biography available? Does this event require sponsor recognition? Are there any existing collaterals (e.g., posters, printed program, video content) and/or photography available? If no, will you require any? Will you need consultation for audio-visual presentations as well as talking points for university leadership? There are a few steps you may take on your own to spread the word about events for both the on- and off-campus communities. And the Communications Department is ready to partner with you to get the word out as well. Make sure to post your event announcements to the campus community. These postings are the responsibility of the event organizer and distributed daily through the Drew Today email digest. Keep in mind that you can include a hyperlink to a webpage with detailed information so the email text can be concise. Alternatively, the post you create can serve as your event page, if the event is not too involved. You may request the event be featured in Drew This Week, the University’s weekly email digest. Please provide a link to your event page and any available artwork. Contact the Communications Department, which can assist your university-level event promotion through many media, including press releases, social media, invitations (print and digital), digital registration forms, photography and more. How will you measure the impact of communications about the event and of the event itself? Email open and click through rates (Communications can provide upon request). Compare the number of invitations sent to the number registered. Analyze registration method (i.e., online, mail, phone, walk-in) to determine most effective means of communicating. Drew University has standard designs for letterhead, envelopes and business cards. Please use approved designs for your Drew-related communications. Printed university letterhead and envelopes may be ordered through the Print Services unit. 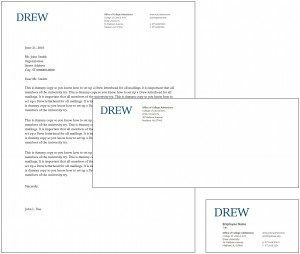 Members of the Drew community may create personalized letterhead using the MS Word template in our Communications Toolkit. Business cards may be purchased on the Drew University Staples online store. If you do not have access, please contact Maria Zaccagnini in Purchasing at mzaccagn@drew.edu.